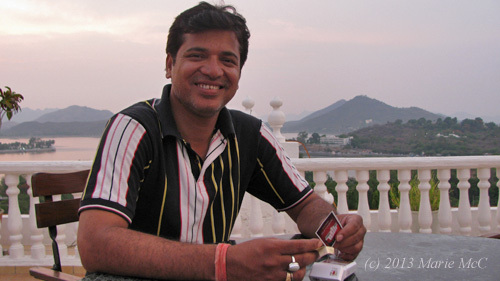 Nirmal promised to take me to heaven — and delivered! Nirmal promised to take me to heaven, and he did. Zannat (JAN-nat, pronounced with a slight pause between the syllables) is the Urdu word for heaven. 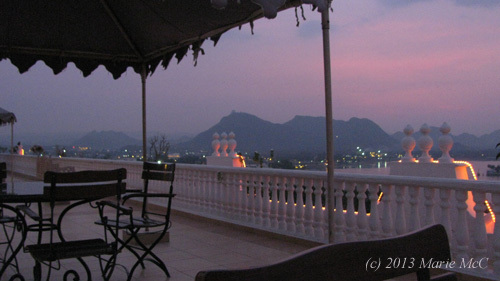 It’s also the name of the rooftop restaurant at the Hotel Hilltop Palace in Udaipur overlooking Lake Fateh Sagar and is a very special place for Nirmal. 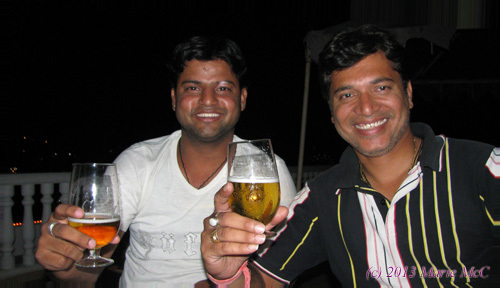 On June 9, 2013, Nirmal arranged a special get together here for just the four of us. We had a lot to celebrate. Although my last visit was only seven months ago, it felt like it had been far too long since I’d seen my dear friends. We enjoyed the exquisite view, had some laughs and planned what we would do while I was here this time. 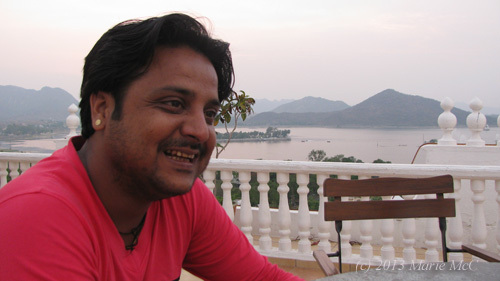 As the sun set over the Aravalli Hills, there was nowhere nearer to heaven on earth. The guys consider me part of their family now. We have grown that close in a very short time. 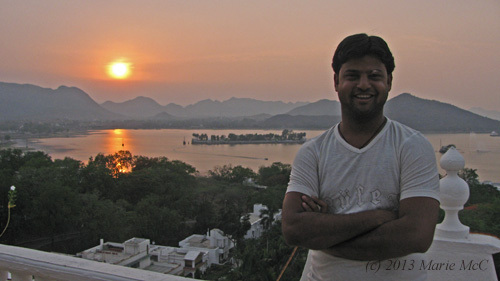 And now that I have family here, when I come to Udaipur, it’s more like returning home than visiting. 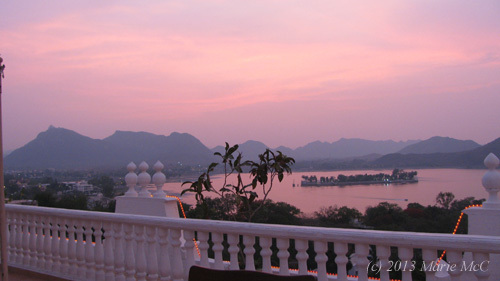 Udaipur, Zannat and my Indian family — they are all heaven to me. Massage parlors in Udaipur are a dime a dozen. They’re everywhere. Prices range from 500 rupees an hour to 1,500 or more. The challenge is finding a good one. Anyone who has an interest in recommending a massage place (for example, a hotel) will be sending you to a place where they’re getting a commission, regardless of whether the place does good work or mediocre. I first went to a place recommended by my hotel because my friends were busy, and I thought I’d try to be a bit more independent, like I usually am. I clearly said I wanted pain relief, not relaxation. The price was 1,400 rupees, which included a rickshaw pickup and dropoff. I got no pain relief at all, but the hotel of course got their percentage. So back to my friends I went for a recommendation. This time, I got taken to a really good therapeutic massage center. 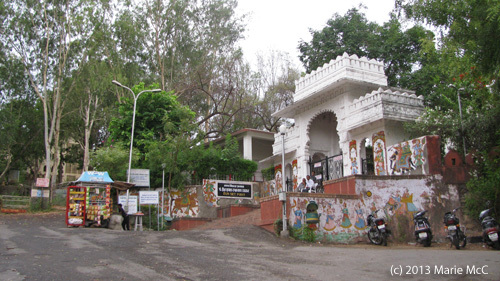 Ayur Santushti, located in a cul-de-sac near Gulab Bagh, is about a five-minute, 50 rupee rickshaw ride from the Jagdish Temple. It’s owned and operated by Mr. P.M. Menon and his wife Anita. 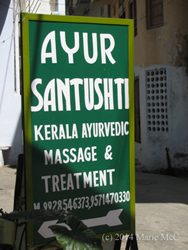 They were trained in ayurvedic massage at Kerala and have been doing it for twelve years. Because of cultural norms, Mr. Menon works on men only and Anita works on women only. After only one massage, I felt quite a bit of relief. I had been having stiffness and pain in my lower back and was walking slightly bent over. After the massage, it was easier to straighten up, and much easier to climb stairs. I went for two more, which was all I had time for before I left. What a difference! On my next trip, I plan on having a daily therapeutic massage for a week before going anywhere or doing anything else. The price for a one-hour therapeutic massage was 1,500 rupees. At the time (June 19, 2013), the price was equivalent to about US$25. Massage for me in the US is no longer affordable. I’ll now be doing all massage therapy in Udaipur. I’ve been keeping a secret. 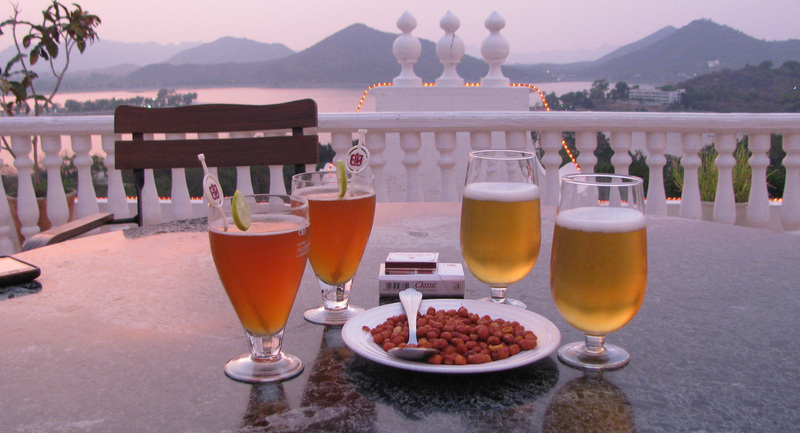 Four months ago I made plans to come back to Udaipur. Nirmal and I decided not to tell Rafiq or Pushker. He gave them a story about picking up a friend from France at the airport on May 31st, and much to their surprise, it was me who arrived! We’ve been busy the past 12 days talking, laughing, eating and relaxing. It’s been so hot, I haven’t really wanted to do much sightseeing. I could have come at a cooler time of year, but since the three of them have more free time in the off season — which is now — I came despite the heat. 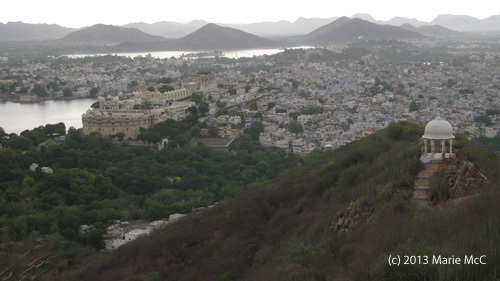 We did go to Sunset Point one day and rode the cable cars to the top of the hill for some spectacular views of Udaipur. 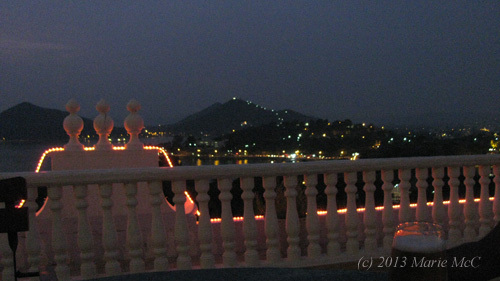 while Lake Fateh Sagar shimmers in the distance. 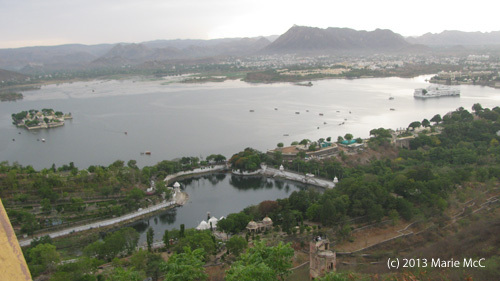 Lake Pichola, with Doodh Talai — the small pond — in the foreground.